Always strive for a slow and steady weight loss rather than a quick and short-lived one. 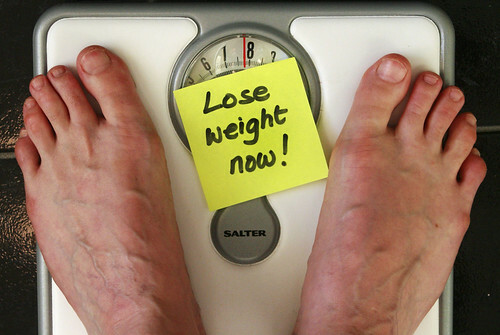 When it comes to weight loss, people love to lose weight as quickly and as big an amount as they can. However, did you know that there is only a limit to losing weight every week? Going more than this recommended rate can be dangerous to your health and can actually pose more health problems. Find out why it is important to adhere to a slow and steady rate of weight loss. A healthy and safe rate for weight loss should be between ½ and 1 kg per week, which is equivalent to 1 and 2 pounds. When you lose this amount of weight, you lose around 500 to 1,000 kcal of energy per day, however, it still allows for a healthy eating pattern. Anything more than this and your metabolic rate slows down and you start losing muscle as well. If your metabolic rate slows down, you have to work extra hard in order to lose weight. Apart from decreased metabolic rate and wasting of lean muscle tissue, rapid weight loss can also cause dehydration, which is actually a temporary weight loss. Another risk brought about by fast weight loss is extreme and frequent fatigue, which can cause you to sleep at irregular hours everyday. Other health risks include anemia, bowel irregularities, heartbeat irregularities and even gallstone formation. Those who want to lose weight fast often go into a crash diet or follow a fad diet. The problem with fad diets is that they are not sustainable. Often, fad diets provide rapid weight loss, but for only a short period of time. When looking for the best diet, go for a diet that does not restrict a certain food group. Regulation here is the key, not deprivation. If a diet restricts you from eating a certain food group, chances are, you are bound to fail in the long run. Your objective for losing weight should be long-term rather than just for a specific period of time. Weight control and management should be a lifetime choice and should form part of your lifestyle. Therefore, it is imperative that such should form into a habit. Once you go into a gradual, steady weight loss, your body would have time to adjust to the changes it undergoes. You can avoid binge eating and uncontrollable cravings if your body is well adjusted. Based on a UCLA survey on obesity and dieting, most of the subjects regained weight within two to five years. To help you maintain weight efficiently, regular exercise must form part of your long-term plan. Exercise, particularly, cardios helps you burn fats. Once you do so, you need to incorporate strengthening and toning exercises to help maintain your muscle integrity. Remember that muscles burn more calories than fats. Therefore, building more muscles can actually speed up your metabolism. Once you achieve your target weight, diet and exercise do not stop there. For sure, by that time, those habits would grow into you that you’d find it difficult to stray away from them.